The Applicant seeks permission to add a screened outdoor deck on the rear of their home which would increase their lot occupancy from the current 43% to 46.4%, which exceeds the allowable lot occupancy in an R-2 zone of 40%, thus requiring a special exception for the 6.4% deviation. The construction of the proposed addition will result in the slight loss of permeable surfaces, and loss of some shrubs and other plantings. It will remove this amount of land—for all intents and purposes—from serving the public good permanently. The Applicant has presented a letter of support for this project and special exception from the neighbor who owns and occupies the other half of the semi-detached home they occupy and the ANC has heard no opposition from any nearby neighbors. ANC 3E and the BZA have routinely granted such requests, particularly when nearby neighbors express support, as is the case here. While the law does not specifically require it today for residential projects, there is an increasing trend, as reflected in proposals in the zoning rewrite chapters on pervious surfaces, green area ratios, and tree canopy, to call for environmental mitigation steps to address potential adverse consequences in connection with requests for relief from zoning requirements. ANC 3E believes that regulations governing zoning relief should be changed to (at a minimum) require such mitigation. Such an approach would serve to promote our city’s environmental goals, including maximizing pervious surfaces and green area, managing stormwater, preserving habitat for wildlife, and reversing the decline of our tree canopy. All these things serve the greater good of our communities. In the meantime, ANC 3E believes that it may properly condition support for applications to exceed zoning requirements on whether such projects at least reduce stormwater runoff and tree loss to no more than would be expected to occur were the same project to meet zoning requirements. ANC 3E has done so here and intends to do so for future applications. Applicant will install a rain barrel on the new downspout attached to this addition. Applicant will remove an existing shed on the rear of the property and the concrete pad on which it sits and will plant a tree in its place, effectively offsetting the loss of permeable area and foliage. THEREFORE BE IT RESOLVED, based on our assessment of the project, in light of the support for it expressed by the nearby neighbors and the Applicant’s agreement to the foregoing terms, we support the Application here (BZA Case No. 19994) provided that BZA incorporate the Mitigation Requirements in its order approving the application. 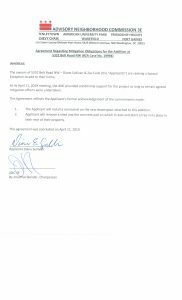 ANC 3E approved this resolution at its Special meeting on April 11, 2019, which was properly noticed and at which a quorum was present. The resolution was approved unanimously by a vote of 0-0-0. Commissioners Jonathan Bender, Greg Ehrhardt, Amy Hall, Jonathan McHugh and Tom Quinn were present.